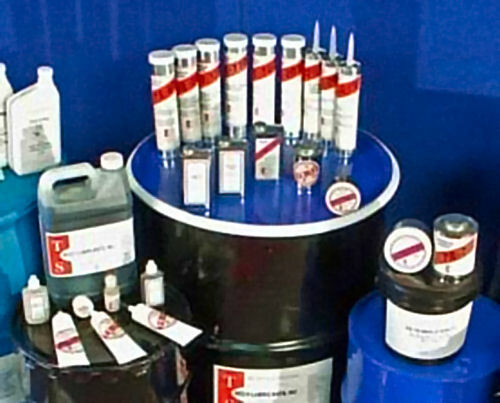 TS-64 is a special purpose grease designed for service temperatures in the range of 800oF (427oC) to 1,200oF(649oC) and higher. It has been used sucessfully in kiln car bearings extending cycles for as long as twelve days at a sustained temperature of +900oF (482oC). TS-64 is recommended for most heavy duty industrial applications involving elevated temperatures beyond the useful range of other greases. TS-64 is nonflammable. With increasing heat the fluid portion evaporates leaving significant deposits of lubricating solids to facilitate interaction between moving parts until the cycle is finished. The downward peaks in the graph below indicate loss by evaporation. Note the absence of upward (exothermic) peaks which would indicate oxidative activity. Other greases burn at temperatures well below 7000F leaving a hard varnish-like residue on mating surfaces. This oxidation process may generate flames, smoke and other combustion by-products. It is recommended that kiln car bearings be re-lubricated after each cycle.